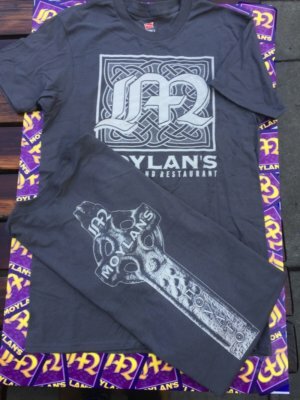 Our classic Moylan's logo on the front on a Hanes Tagless 100% cotton shirt. 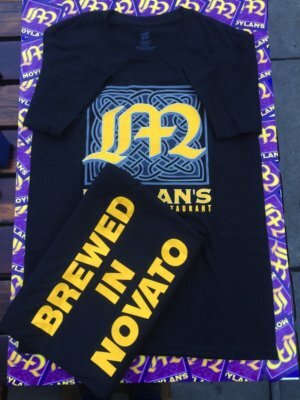 'Brewed in the Golden State' on the back! ***Special deal for a limitied time online - normally $19.95 - these shirts are just $14.95 including shipping! 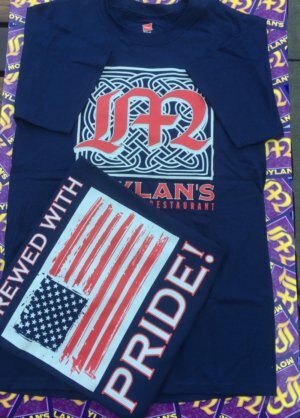 Our classic Moylan's logo in red, white and blue on a Hanes Tagless 100% cotton shirt. "Brewed with pride!" flag logo on the back. 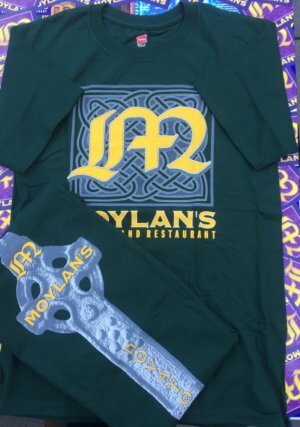 Our classic Moylan's logo on a green Hanes Tagless 100% cotton shirt. Moylan's Irish cross logo on the back. Our classic Moylan's logo on a sinister black Hanes ComfortSoft 100% cotton shirt. "Brewed in Novato" on the back. 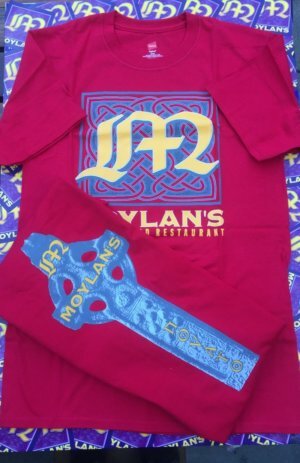 Our classic Moylan's logo on a red Hanes Tagless 100% cotton shirt. Moylan's Irish cross logo on the back. Medium gray Hanes Tagless short sleeve t-shirt. 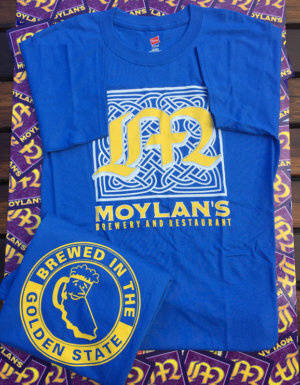 Features the classic Moylan's logo on front, and Moylan's Irish cross logo on back. 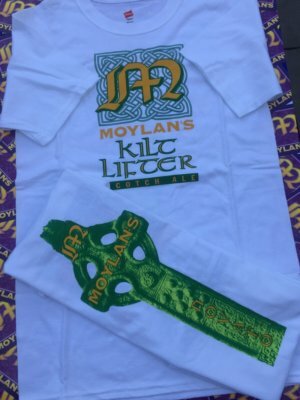 Our classic Moylan's logo and the Kilt Lifter Scotch Ale logo on a white Hanes Tagless 100% cotton shirt. 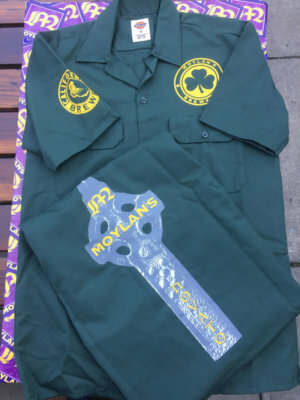 Moylan's Irish cross logo on the back. 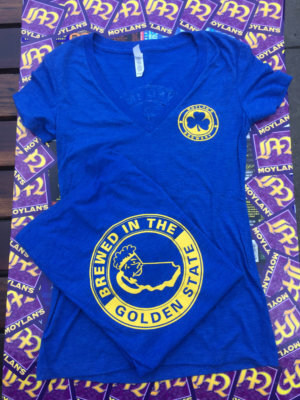 Royal blue woman's short sleeve V-neck shirt features Moylan's shamrock logo on front, and Golden State logo on back. Women's short sleeve crew neck t-shirt. 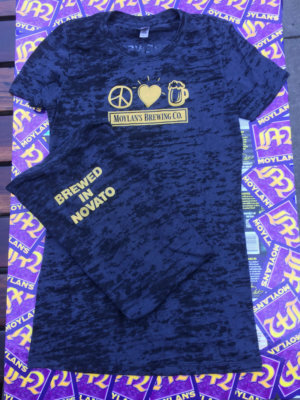 Features Moylan's Peace, Love & Beer logo on front, and "Brewed in Novato" on back. Unique "burnout" dark blue color pattern. Dickies brand button-up uniform shirt. Twin breast pockets. 65% polyester/35% cotton. Features Moylan's shamrock logo on front, California brewed logo on right arm, and Irish cross logo on back. 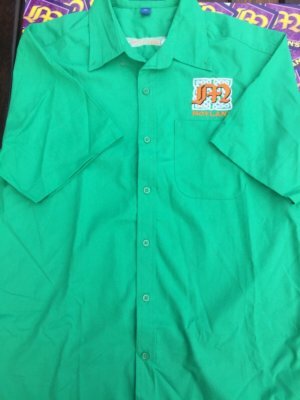 Bright green short sleeve, collared, button up Port Authority shirt. Features a breast pocket, the classic Moylan's logo on the front, and small logo on the back below the collar. New for 2019! Our Classic Black T-Shirt with an Irish-Themed Twist! 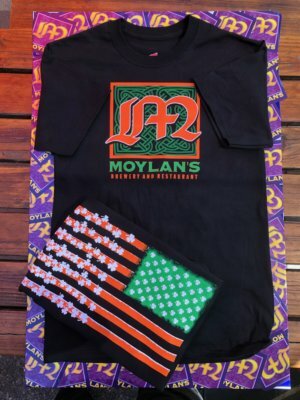 The front features the Moylan's Celtic "M" in orange along with a green background. The back of the shirt has an orange and green flag with white shamrocks.